This Barefoot Bloggers dessert was pretty easy to make and assemble. I've made meringue cookies before, but this was the first time I made any of this size. They are really like individual pavlova portions. They look so decadent and impressive on the plate. Just keep in mind that you need to make the meringues ahead of time. I used extra blueberries in the sauce since I had them on hand. Overall, it was a delicious and "light" dessert. Thanks to BMK of Reservations Not Required for the selection. Preheat the oven to 200 degrees F. Line 2 baking sheets with parchment paper. Using a small glass and a pencil, draw 6 (3 ½-inch) circles on each piece of paper. Turn the paper face-down on the baking sheets. In the bowl of an electric mixer fitted with the whisk attachment, beat the egg whites, cream of tartar, and a large pinch of salt on medium speed until frothy. Add 1 cup of the sugar and raise the speed to high until the egg whites form very stiff peaks. Whisk in the vanilla. Carefully fold the remaining ½ cup of sugar into the meringue. With a large star-shaped pastry tip, pipe a disc of meringue inside each circle. Pipe another layer around the edge to form the sides of the shells. Combine the blueberries, one-half pint of raspberries, ¼ cup water, the sugar, and zest in a saucepan and bring to a boil. Lower the heat and cook uncovered over medium-low heat, stirring occasionally, for 8 to 10 minutes. The juice will become a syrup and the berries will be slightly cooked. Off the heat, stir in the remaining raspberries and the framboise. Set aside. I had a craving for warm, creamy risotto for lunch this week. While there are a hundred different risotto recipes, this is one of my favorites. The trick to making risotto is constantly stirring it while it absorbs the liquid. I love the mild woodsy flavor of the wild mushrooms. The truffle oil drizzled on top adds a beautiful finish to this dish, reminding me of our vacation in Italy. For a vegetarian version of this dish, simply substitute vegetable stock for the chicken stock. Bring the stock to a simmer in a small saucepan over medium-high heat. Reduce the heat to low, cover, and keep the stock hot. Heat the olive oil in a large heavy-bottomed saucepan over medium-high heat. Add the onion and sauté, stirring frequently with a wooden spoon, for 2 minutes. Add the mushrooms and cook until tender and slightly brown, about 8 minutes. Add the garlic and cook for 2 minutes more. Add the rice and stir well, about 30 seconds. Add the wine and simmer, stirring constantly, until the liquid is absorbed, 2 to 3 minutes. Add ¾ cup of the hot stock, reduce the heat to medium, and cook, stirring frequently, until the stock is absorbed. Add the remaining hot stock ¾ cup at a time, stirring frequently and allowing each addition to be fully absorbed before adding more, until the rice is just tender and the risotto is creamy. The total cooking time is 20 to 25 minutes. Stir in the ¼ cup cheese, the thyme, and butter. If the rice appears dry, add up to ¼ cup water to loosen the risotto slightly. Season with kosher salt and pepper to taste. Serve in large bowls and drizzle with truffle oil, if desired. Sprinkle with 2 tablespoons cheese and the chives. 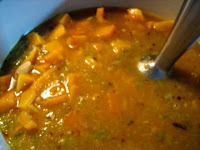 Butternut squash soup is one of my favorites. The ingredients are so simple—really just a purée of butternut squash, garlic, leeks, and stock. This recipe does require some prep work with roasting the butternut squash and garlic, (you can certainly cut down the prep work by purchasing pre-cut squash and pre-peeled garlic), but the work you put into this dish is certainly rewarded. The natural sweetness of the roasted butternut squash and garlic comes through in a thick, silky purée and a beautiful, rich orange color. Preheat the oven to 350 degrees F. Cut the squash in half length-wise and remove the seeds and any fibers. Carefully remove the peel and cut the flesh into slices 1 inch thick. In a roasting pan, combine the squash and garlic cloves. Drizzle with 2 tablespoons of the oil and toss until well coated. Pour in the water. 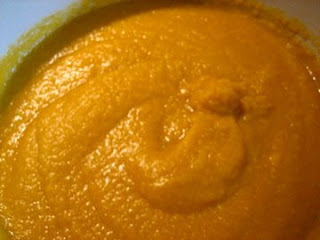 Roast, stirring occasionally, until the squash and garlic are soft and golden, 50-60 minutes. Add a bit more water if the squash begins to scorch. Remove from the oven and set aside to cool slightly. While the squash and garlic cloves are roasting, in a heavy frying pan over medium heat, warm the remaining 2 tablespoons oil. Add the leeks and sauté until golden brown, 12 to 15 minutes. Set aside. In a blender, in batches, or with a hand-held immersion blender, combine the roasted squash, garlic, and leeks with 1 cup of the stock. Purée until very smooth, about 1 minute. Transfer the squash purée to a large saucepan. Stir in the remaining 4 cups stock and bring to a simmer over medium heat. Season to taste with salt and white pepper. Ladle the soup into warmed bowls and garnish with the chives. Serve immediately. McHubby requested this dish for dinner this week—it’s one of his favorites. Since he loves it so much, I always make a big batch in a large casserole pan. I modified the classic tuna casserole recipe a bit, using whole wheat egg noodles, cremini mushrooms, shallots, garlic, celery, and fresh herbs for a more earthy flavor. The French fried onion topping adds a crunchy texture. Cook whole wheat egg noodles in salted boiling water, according to package directions. Drain. Meanwhile, heat olive oil over medium heat in a saute pan. Add shallots and celery and cook until softened, about 3 minutes. Add mushrooms and cook another 6 to 8 minutes. Add garlic, rosemary, and parsley, cooking 1 minute longer. Remove from heat and set vegetable mixture aside. In a large mixing bowl, combine cooked noodles, tuna, soup, vegetable mixture, 1 cup of mozzarella, salt, and pepper. Spread the mixture in a large casserole pan. Top with remaining cheese and fried onion topping. Cover with aluminum foil and bake for 30 minutes. Remove foil and bake for another 10 minutes, until topping is golden brown. Serve hot. We have good friends near Sarasota, Florida, whom we visit every year. They took us to the Columbia Restaurant, which specializes in Spanish cuisine. Their Original “1905” Salad commemorates a 100+ year old family recipe and the year they opened the original Columbia Restaurant in Tampa. The ingredients are simple, but the combination with the vinaigrette is just delicious. Mix garlic, oregano, and Worcestershire sauce in a bowl. Beat until smooth with a wire whisk. Add olive oil, gradually beating to form an emulsion. Stir in vinegar and lemon juice and season with salt and pepper. Add dressing to salad and toss well. Add Romano cheese and toss one more time. Serves 4. Split pea soup always reminds me of my grandmother. It must have been one of her favorite soups, but hers was a starchy and thick consistency. This recipe, on the other hand, is a marriage of textures; it creates a more puréed soupy consistency while still maintaining the integrity of the split peas. The result is a healthy and tasty semi-chunky soup—the crumbled bacon garnish adds a nice contrasting smoky, salty flavor with a crunchy texture. An alternative garnish is chopped honey-baked ham. This recipe can easily made vegetarian by using vegetable stock instead of chicken stock and omitting the bacon. For the smoky flavor, use Liquid Smoke instead. The original recipe is posted below, but I use a ham hock instead of the 2 bacon slices for flavoring the base of the soup. In a large saucepan over medium heat, warm the oil. Add the onion and sauté until softened, 3-5 minutes. Add the celery and carrots and sauté until just slightly softened, 3 minutes. Add the split peas, stock, 2 slices of the bacon, parsley, marjoram, and thyme. Reduce the heat to medium-low and bring to a simmer. Cover partially and cook until the peas are tender, 50-60 minutes. Discard the bacon. Meanwhile, in a frying pan over medium heat, fry the remaining 4 slices of bacon until crisp, about 10 minutes. Transfer to paper towels to drain. When cool, crumble and set aside. Coarsely purée 2 cups of the soup in a food processor (or with a hand-held immersion blender) and return the pureed soup to the saucepan. Season with salt and pepper to taste, return the soup to medium heat, and simmer for 5 minutes longer. Taste and adjust the seasoning. Ladle the soup into warmed bowls and garnish with the crumbled bacon. Serve immediately. Stir together pesto, salt, and pepper in a medium mixing bowl. Add pork and, using your hands, gently yet thoroughly combine; do not overmix. Shape pork mixture into 4 equal-sized balls. Press 1 mozzarella cube into the center of each ball; gently form a ¾-inch-thick patty, enclosing the cheese. Lightly coat a large nonstick skillet with cooking spray. Heat over medium-high heat. Add burgers, cooking in batches if necessary, reduce heat to medium, and cook 5 minutes per side. Serve hot. I love casseroles, because you can “cook once and eat twice.” They are economical on the budget and on my time. And who doesn’t love baked pasta dishes? This is a hearty dish that pleases many palates. I’ve made this baked ziti for friends with children and for a friend preparing to run in a race. It’s easy to prepare and delicious, even as leftovers! Cook ziti according to package directions. Drain and set aside. In a large saucepan, sauté onion in olive oil for approximately 3-5 minutes, until translucent. Add garlic and cook for another minute. Add mushrooms and sauté for another 5 minutes until mushrooms are softened. Set aside in a bowl. In the same saucepan, brown the ground beef and sausage. Drain excess liquid. Combine the meat mixture, vegetables, and spaghetti sauce in the saucepan. When sauce boils, reduce to a simmer and add the rosemary, oregano, basil, and sugar. Salt and pepper to taste. In a lightly greased casserole pan, place a few spoonfuls of sauce on the bottom of the pan. Layer half of the ziti. Layer the provolone cheese, then the sour cream. Spoon half of the sauce. Layer the remaining ziti. Sprinkle mozzarella cheese over ziti. Spoon in remaining sauce. Sprinkle with Parmesan cheese. Bake for 30 minutes, or until cheese is melted throughout. I admit that I have a long-standing unabashed love affair with all things vanilla. Naturally, I couldn’t resist making some vanilla sugar. I used Tahitian vanilla beans in mine. With t he added vanilla beans, my sugar container now has such an intoxicating and irresistible scent. I usually try to substitute some vanilla sugar for regular sugar in sweet baking recipes. If vanilla bean is whole, slice down side of bean with back of knife and scrape seeds into airtight container with the sugar. Bury bean in sugar and seal tightly with lid. Let sit for 1 to 2 weeks. Use as regular, granulated sugar. McHubby and I went to French Polynesia (Moorea, Bora Bora, and Tahiti) for our honeymoon. While we were there, I bought some Tahitian vanilla beans and later used them to make this extract. It’s a sweet reminder of our vacation every time I use it! Combine the vanilla beans and vodka in a jar tall enough to hold the vanilla beans. Allow the mixture to sit at room temperature for at least a month until the vodka becomes vanilla extract and the beans are soft enough to cut the end and squeeze the seeds out. Add more vanilla or beans, as needed. The extract can sit at room temperature indefinitely. This recipe produces a “cakey” cookie with a delicate lemon flavor. Even McHubby, who doesn’t usually care for lemon flavors, really enjoys this cookie. It’s perfect when you crave a light bite of something sweet! I substituted 1 cup of vanilla sugar for regular sugar, since I have some on hand and try to use whenever possible. Combine the powdered sugar, lemon juice, and lemon zest in a small bowl and stir until smooth. Spoon about ½-teaspoon onto each cookie and use the back of the spoon to gently spread. Let the glaze harden for about 2 hours. Grilled cheese sandwiches are one of my favorite comfort foods. I tend to use whatever cheese I have on hand and add other ingredients, like tomatoes or arugula. When making grilled cheese, there are a number of ways to build the sandwich. I prefer to build it in the grill pan, but McHubby usually assembles the sandwich first and then places it in the pan to cook. Also, I like to oil the bread instead of the pan—it uses less oil and cooks directly into the sandwich. Regardless of how you build your grilled cheese panini, it never disappoints! Heat a grill pan. Drizzle olive oil on one side of a slice of bread and place onto the hot pan. Reduce the heat to medium-low. Layer a slice of cheese, tomatoes, and another slice of cheese. Top it with the other bread slice and drizzle the outside with olive oil. Cook for 3-4 minutes. Check the underside of the sandwich, and when brown grill marks are visible, flip the sandwich over. Be careful not to burn the bread. When grill marks are visible on the underside of the sandwich, remove from the grill pan. The cheese should be melted and the bread toasted golden brown with grill lines. Serve hot. I'm excited to have recently joined Barefoot Bloggers, especially since I have been a longtime follower of the Barefoot Contessa. This week, we're making Ina's Real Meatballs and Spaghetti. The meatballs are delicious, tender, and moist. McHubby and I both loved this dish! Thanks to Rebecca of Ezra Pound Cake for this selection. 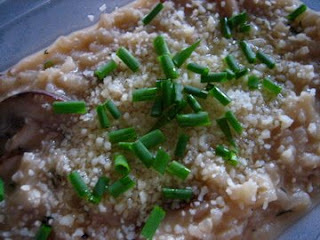 Place the ground meats, both bread crumbs, parsley, Parmesan, salt, pepper, nutmeg, egg, and ¾ cup warm water in a bowl. Combine very lightly with a fork. Using your hands, lightly form the mixture into 2-inch meatballs. You will have 14 to 16 meatballs. Pour equal amounts of vegetable oil and olive oil into a large (12-inch) skillet to a depth of ¼-inch. Heat the oil. Very carefully, in batches, place the meatballs in the oil and brown them well on all sides over medium-low heat, turning carefully with a spatula or a fork. This should take about 10 minutes for each batch. Don't crowd the meatballs. Remove the meatballs to a plate covered with paper towels. Discard the oil but don't clean the pan. Lunch for us this week is Poisson en Papillote, or fish in parchment. These baked little fish packets are easy to prepare and take to work. I used cod this time, since they were on sale this week at the grocery store. Depending upon the fish you use, cooking times may need to be adjusted. Cooking the fish in parchment paper locks in moisture and keeps it flaky and cooked perfectly. In a bowl, whisk together the zest and juice of a lemon, minced garlic, balsamic vinegar, and olive oil. Set aside sauce mixture. In the center of a piece of parchment paper, place a piece of fish. Top with ¼ of shallots, peppers, tomatoes, capers, parsley, and sauce mixture. Fold over the sides of the parchment and roll to form a sealed pouch. Repeat for other three pieces of fish and remaining ingredients. Arrange the pouches on a baking sheet and bake for 20 minutes. McHubby and I have started a tradition of getting cupcakes every time we g o to the movies. There is a bakery near the theater called Edibles Incredible Desserts, and their homemade cupcakes are delicate works of art. The cakes alone are delicious and moist, but then they are beautifully adorned with buttercream icing. The whipped icing is so fluffy and light, it truly just melts in your mouth. These lovely cupcakes have quickly become one of my favorite splurges! When the weather is cold outside, I crave a steaming hot bowl of soup with a grilled cheese sandwich, which is one of my favorite easy comfort meals—so soothing! This chunky soup is full of flavor, and with all the vegetables, it’s also pretty healthy. * For a vegetarian version, simply substitute vegetable stock for the chicken stock and (obviously) omit the kielbasa. In a large stockpot over medium heat, heat the olive oil and sauté the onions, leeks, garlic, salt, pepper, thyme, and cumin for 20 minutes, or until the vegetables are translucent and tender. Add the celery and carrots and sauté for another 10 minutes. Add the chicken stock, tomato paste, and drained lentils, cover, and bring to a boil. Reduce the heat and simmer uncovered for 1 hour, or until the lentils are cooked through and tender. Check the seasonings. Add the kielbasa and red wine and simmer until the kielbasa is hot. Serve drizzled with olive oil and sprinkled with grated Parmesan. McHubby and I often pack and take our lunch to work. While I can appreciate a good PB&J every now and then, sandwiches can be pretty boring to take every day. So I try to find recipes that are quick to make, easy to pack, and delicious. This one is made in the slow cooker. Then we pack the shredded chicken, napa cabbage, and tortillas separately—ready to assemble for lunch. The original recipe is listed below, but I also added one clove of garlic, minced. Place onion in a 3- or 4-quart slow cooker. Sprinkle chicken evenly with salt and pepper. Brown chicken 2 to 3 minutes on each side in hot oil in a large skillet over medium-high heat. Remove skillet from heat, and place chicken on top of onion in slow cooker. Whisk together hoisin sauce and next 4 ingredients; pour over chicken. Cover and cook on high 1 hour. Reduce heat to low and cook 5 hours. Shred chicken in cooker with fork. Top each tortilla evenly with cabbage, chicken, and green onions. Fold bottom edge of each tortilla in to hold filling; roll tortilla crosswise, and, if desired, secure with wooden picks or parchment paper. Makes 8 servings.